IPCC Method Of Proving The 'Human Caused Warming' (AGW) Hypothesis Forced Deliberate Creation of Misinformation | Watts Up With That? The 2001 Intergovernmental Panel on Climate Change (IPCC) Report included evidence in the form of a “hockey stick” graph, showing that the Medieval Warm Period (MWP) did not exist. Less prominent, but just as wrong, was erasure of the Little Ice Age (LIA). Proponents of the IPCC hypothesis that human CO2 is causing global warming were mainly connected with the Climatic Research Unit (CRU) at the University of East Anglia. Leaked CRU emails, beginning with 1000 in late 2009, exposed the corruption of climate science of the IPCC. CRU people controlled critical portions of IPCC Working Group I. They set up procedures to control the peer-review process, control data, and attack any who challenged, especially if it was with contradictory evidence. This was necessary because they deliberately thwarted the scientific method by presenting an hypothesis and blocking normal and essential skepticism. They determined to prove rather than disprove the hypothesis. As Richard Lindzen correctly observed decades ago, the consensus was reached before the research had even begun. Evidence emerged, despite their efforts, so they created pseudoscientific vehicles to counterattack. One vehicle was William Connolley’s control of over 500 Wikipedia articles. Connolley took control of all things climate in the most used information source the world has ever known – Wikipedia. Starting in February 2003, just when opposition to the claims of the band members were beginning to gel, Connolley set to work on the Wikipedia site. He rewrote Wikipedia’s articles on global warming, on the greenhouse effect, on the instrumental temperature record, on the urban heat island, on climate models, on global cooling. On Feb. 14, he began to erase the Little Ice Age; on Aug.11, the Medieval Warm Period. The web site, RealClimate, was another major vehicle created by Michael Mann and Gavin Schmidt, who invented the name. It sounds innocent but was used in a very different manner. Schmidt’ phraseology is revealing. The idea is that we working climate scientists should have a place where we can mount a rapid response to supposedly ‘bombshell’ papers that are doing the rounds and give more context to climate related stories or events. The phrase “working climate scientists” was used frequently as a put down, such as by Andrew Weaver in his public attacks against me. Unless you are one, you have no credibility or right to an opinion. It reflected concern about the growing group of qualified, but older climate experts, speaking out about what the IPCC was doing. It was a deliberate attempt to marginalize. What is a “bombshell” paper? Invariably, it was one that contradicted their claims. Normally, these were ones that showed current climate is well within natural variability and not linked to human activity. The fundamental objective of the anthropogenic global warming (AGW) hypothesis is to show human behavior and particularly industrial development is unnatural and creating unnatural changes. This illusion allows them to point to any natural event and imply it is unnatural. Skeptical evidence consistently showed it was not, but most people didn’t know, so, sadly, it was effective. Temperature range in the Antarctic ice core record (Figure 1) is approximately 12°C and the three previous Interglacials were warmer than today. Both facts were effectively ignored by diverting attention to the apparent relationship with CO2. Within five years it was shown to be opposite to the assumption in the hypothesis because temperature changed before CO2. The Holocene Optimum, formerly called the Hypsithermal and/or the Climatic Optimum, was a warm period during which most of ice from the last Ice Age phase melted. 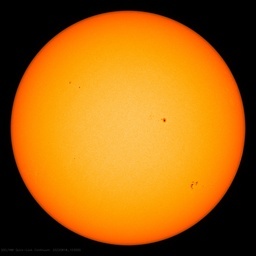 Several have written effectively about AGW claims for this period, including Steve McIntyre and. Anthony Watts. Michael Mann’s comment was an attempt to deflect the evidence. This [Holocene Climatic Optimum] is a somewhat outdated term used to refer to a sub-interval of the Holocene period from 5000-7000 years ago during which it was once thought that the earth was warmer than today. We now know that conditions at this time were probably warmer than today, but only in summer and only in the extratropics of the Northern Hemisphere. Mann is incorrect because most of the last 10,000 years was warmer than today as the Greenland ice core shows. Two indicators of the temperature range are the Greenland ice cores and the global sea level increase. Figure 2 is a slide linking R. B. Alley’s temperature plot with a photograph of a fossilized 4940-year-old White Pine located 100 km north of the current tree line. Graph temperature range is approximately 4°C. 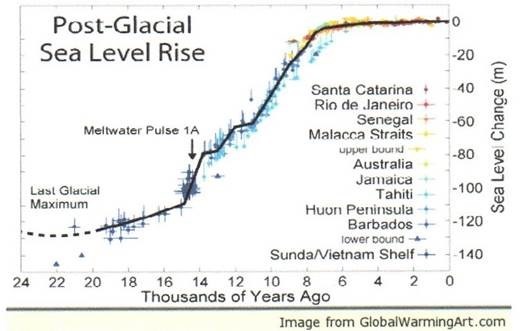 Sea level rise is compiled in Figure 3 and shows most occurred between 15,000 and 7,000 years ago. It is not a sub-interval as Mann claims. Determination to rewrite history and “prove” the claim that current climate is unnaturally warmer than ever, really became focused after the 1990 IPCC Report. It contained the illustration 7 (c) that showed the MWP and the LIA (Figure 4) and contradicted the IPCC hypothesis. My discussions with Lamb about the graph involved the beginning and ending points of both the MWP and the LIA. It was crucial because my period of study potentially covered the end of the MWP and the onset of the LIA. Those questions didn’t concern the IPCC because for them they didn’t exist. He said the graph was of temperatures for the Northern Hemisphere and the dotted line represented the average temperature of the 20th century. Lamb defined them by the dotted line on the graph, as the labeling indicates. It was also in a region, central Canada, were transition was important because it covers the annual shift of the Circumpolar Vortex (CV). The average latitude changes in mid continent seasonally from approximately 30° to 65°, but these latitudes change as global climate changes. The latitude shift in the CV was captured in my analysis of wind directions, among other variables. This was included in my doctoral thesis (1982) and peer-reviewed papers. 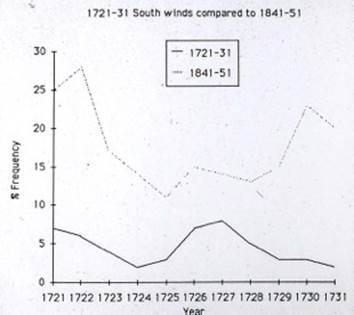 Figure 5 shows changing percentages of southerly winds at York Factory for two decades: 1721 -31 was within the LIA and 1841 – 1851 apparently not. Source: Ball,.T.”A Dramatic Change in the General Circulation on the West Coast of Hudson Bay in 1760 A.D.: Synoptic Evidence Based on Historic Records”, Syllogeus Climatic Change in Canada 5: Critical Periods in the Quaternary Climatic History of Northern North America, Editor, C.R. Harington, National Museums of Canada, 1985, Vol. 55, pp. 219-229. Fewer than 10 percent were southerly winds in the decade 1721 -1731 but they were more than 10 percent between 1841-1851. The IPCC claimed the MWP and LIA did not exist. This allowed them to avoid the real issue, which is not whether the warmer and cooler periods occurred, but when they began and ended. That question requires an explanation of the mechanism of change. Consider the debate going on today about the changes in the Circumpolar Vortex. Saying they don’t exist eliminated the need to consider evidence of solar causes of changing CV latitude and the shift of patterns between Zonal and Meridional Flow. This, by default, narrows the focus on human production of CO2 as the cause of change. A general synopsis of Lamb’s views on the MWP and LIA from our discussions is that they both occurred and were global. Dates of onset and termination varied, often significantly, depending on dominant factors in different regions. He identified land – water juxtapositions and topography as two major factors with these being of greater import in Polar Regions. The IPCC set up a system to prove the anthropogenic global warming hypothesis. They created a false imagery, supposedly verified by computer models, orchestrated to produce predetermined results. They made valiant efforts to control the entire climate research area, from funding through peer review and publications. Despite these efforts, evidence kept emerging that disproved the hypothesis. Instead of accepting and accommodating, they set up agencies to counter and hopefully negate them. This paralleled their practice of changing names from global warming to climate change, when temperatures leveled after 1998, while CO2 continued to rise. They effectively blocked advances in climate research for 30 years. They had sufficient success to fool the world into unnecessary energy and economic policies that have cost billions so far and it is not over yet, as the Obama administration attacks on coal illustrate. A more concise headline would help your readers. Your article is titled and explains that the “IPCC Method Of Proving The ‘Human Caused Warming’ (AGW) Hypothesis Forced Deliberate Creation of Misinformation”. Well, yes, of course it did! From its inception the IPCC has had the purpose of producing political propaganda in the form of scientific information selected and developed to promote a political agenda. This is formally stated in the IPCC “Principles” which are frequently reconsidered and approved by representatives of the governments which comprise the InterGOVERNMENTal Panel on Climate Change (IPCC). This was done and has been the normal IPCC procedure since then. So, IPCC custom and practice dictate that the most recent IPCC report (AR5) is edited to match its SPMs. This custom and practice enabled the infamous ‘Chapter 8′ scandal so perhaps it should – at long last – be changed. However, it has been adopted as official IPCC procedure for all subsequent IPCC Reports. Appendix A of the present Report (i.e. AR5) states this when it says. The IPCC Reports are pure pseudoscience intended to provide information to justify political actions; i.e.Lysenkoism. And Goddard has brought to our attention some of that misinformation in terms of manipulating the temperature record. What gets me is that this is not a bigger story in the mainstream media. We are seeing that the Chicken Little Brigade has completely fudged the record, so a big question is whether we have been warming at all. The evidence is there, but the problem for us is that revealing this sort of information into the public domain sounds like a conspiracy theory. People find it hard to believer that the Royal society, New Scientist, Governments and universities all fell for this hoax, and the public do not want the arduous task of finding out for themselves. Also the Obama’s relish the opportunity to saving the world by central control. It is all quiet hard for outsiders to grasp. The other side of the coin is that when people do eventually turn against it they will start to lump scientists with bankers and politicians; you cannot believe a word of what they say because they are too busy loading their message to access grants and fortune. The Climate junk science has really damaged the reputation of science. One take on why they do this, is a deep-seated belief that the social and economic system based on fossil fuel use is subject to a Malthusian type catastrophe, that can only be prevented by blocking the system wholly and effectively to begin with. In other words, the system has to be subverted, because it is the system, including science, that is the problem in the first place. In their attempt to save the world from inevitable catastrophe, the normal processes of science have to be suspended. But you are quite right in pointing this out to people in the above, as most people might not actually agree that science has to be suspended for the sake of a ‘higher cause’. IPCC often can not get even basics correct. is regularly shown in their publications. However, one of the crucial parts is wrong in content and substance. with detailed clarification, but did not get even an acknowledgement of the email. Together with the anti-science hypocracy of the IPCC, their ”demands” have lead to refusal of aid for developing countries to increase their energy availability and doubled food costs for these same countries pushing more people into starvation. More and more westerners are also descending into fuel poverty as basic energy costs escalate. Evil bastards. a bit role Kidding! Tim Ball’s role in the linked video is to sound the climactic point, that their theory is all a bunch of baloney (paraphrasing). Btw, promote the above key video on facebook or something, because it’s that important: it will change people’s opinion in 3 NY minutes! The most basic criticism of Climate Alchemy is the IPCC climate modelling, based on the Trenberth et al ‘Energy Budget’, falls at the first hurdle, the creation of extra energy within the system, a ‘Perpetual motion machine of the 2nd Kind’, failing the Clausius criterion of the 2nd Law of Thermodynamics. In short, no professional scientist or engineer can accept it therefore its supporters are unprofessional., no matter how many there are and the number of peer reviewed publications they have produced. Pretty stark, maybe, but science has to be retaken by professionals from those who gained income and status from being unprofessional. Check your language settings Anthony. Many page elements are in turkish. OK – Turkish now gone. So was the problem at my end or at yours. As he tries to rally public support around new White House rules aimed at coal-burning power plants, however, the president hasn’t yet addressed a brewing scandal in the scientific community. Global warming specialists inside the scientific community are buzzing about revelations first made Friday, which show how the the National Oceanic and Atmospheric Administration’s official graph of historical U.S. surface temperatures records has been quietly altered for years. This latest initiative, called “The Risky Business Project,” uses all the usual ruses employed by the imaginative alarmist crowd, more frequent heavy storms, rising sea levels, melting arctic ice caps, and, of course, catastrophic temperature increases. You can talk to them all day about the reductions in heavy storms over more than a decade, the lack of sea level rise, the actual increase of Arctic ice cover, and the 17-year hiatus in global temperature rise, but they won’t want to hear it. But as is the case with the so-called scientists who warn of cataclysmic climate change, one need only follow the money to determine the true motives of the alarmists…. In Steyer’s case, he and his former hedge fund company are invested in a firm that is competing with the Keystone pipeline to transport Canadian tar sands oil. He cited as “another damning example” the information uncovered by Steven Goddard’s science blog. Goddard compared currently published temperature graphs with those based on temperatures measured at that time. The results seem to indicate a downgrade of earlier temperatures and exaggeration of more recent decades. Debunking the latest manufactured controversy about global warming data. To Steven Goddard, Christopher Booker, James Delingpole, Matt Drudge and the rest of the “climate change”-isn’t-real brigade, this is a deadly sin and proves that NASA and NOAA are committing Orwellian thought crimes with the data. have to review (hint, hint!). Oroko Swamp is in New Zealand. The email, from the year 2000, proves Climate scientists knew the Little Ice Age and Medieval Warm Period were global, at a time they were trying to claim in public that these events were regional variations confined to Europe. It’s a good thing Gavin helped set up RealClimate.org because we can browse his responses. See his response to a question about future temperature records being exceeded by 2013. The land based thermometer record is fundamentally flawed, and compromised through endless adjustments, station drop outs and encroachment of urbanisation etc, and it is time that it was ditched. The land based thermometer record should be re-stated to raw data (warts and all), and should end in 1979. A realistic error bar should be set taking into account ‘the warts and all’. Adjustments should not be made to get rid of or smooth the warts and all. As from 1979, only the satellite data should be used, which has better spatial coverage and is less polluted by UHI etc. Again a realistic error bandwidth should be set (taking into account its limitations and issues such as orbital decay and sensor degradation etc).. The two should not be spliced together but it may be appropriate to look at the trends of each, one up to 1979 and the other post 1979, but bearing in mind that they represent a different approach to measuring temperature, and they are measuring a different region. The only land nased thermometer record worthy of being kept is CET, and this is because it is the longest instrument record, and therefore can inform on matters pre dating the 1850s. Again a proper error bandwidth needs to be set. On top of the is we will have ARGO, again warts and all, and once again a proper error bandwidth needs to be set. Since measuring ocean temperature is measuring the right metric (ie, energy content) and given that the oceans contain many more magnitudes of energy compared to the atmosphere, and given that it is the oceans that drive climate, it is only ocean temperature which is of any real note. the problem with ARGO is the short duration of the record. Mann was concerned about the divergence problem post 1960s. 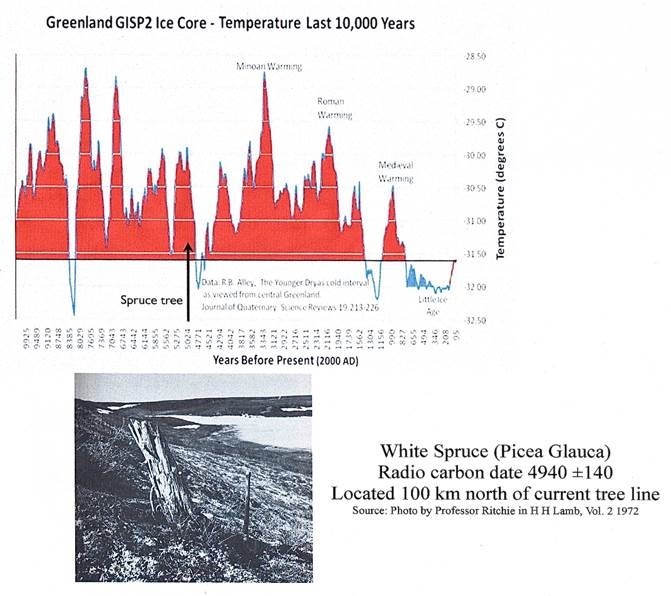 His trees were telling him that there was no post 1960s warming and possibly even cooling, whereas the ‘adjusted’ land based temperature record was suggesting that there was ‘significant’ warming. Perhaps his trees were not as wrong.as he thought. The satellite data confrims that between 1979 and up to and around the Super El Nino of 1998 there was no warming, and the land based thermometer record suggests that there was cooling in the 1960s and early 1970s. See http://www.woodfortrees.org/plot/hadcrut4gl/from:1958/to:1976 which is based upon Hadcrut 4 global mean. Perhaps what Mann had found, through his trees and the divergence problem, was that the ‘adjusted’ land based instrument record had been artifically warmed due to the numerous homogenisation, adjustments, pollution through UHI and station drop outs etc. Who would have guessed it, Good Old Mann. His error was failing to set out his findings on the reliability of the land based instrument record post the late 1970s. That is what his paper should have been on! He can then answer what does observation verses model projection tell us about the state of our understanding and the competency of models to usefully project what will happen. Thank you, Dr. Ball for your unstinting efforts to uncover this worldwide conspiracy and restore Lambs iconic graph of N. hemisphere temps to its rightful place as the starting point of all climate research. Maybe you could just jot in a few figures on the temp axis for clarity? An impressive article that explains the lack of valid science and the extent of political manipulation that props up the warmist alarmism. I think is was a much broader group than that. CRU were important as guardians of hiding/losing/destroying one of the major land temperature records, but it was a broader group that were perverting since to push their politics. The Met Office Hadley Research Centre, charged with managing the sea surface temperatures seems to have some equally enthusiastic characters. One count that came out at the time he got a temporary suspension at WikiPedia was 3500. That is surely way out of date now. Connolley was also a cofounder. of RC and did some (rather unsuccessful ) modelling work for British Antarctic Survey (BAS) as well as being tied to the Hadley Centre around the turn of the millenium. I am waiting for some climate scientist to publish a paper on what the optimum climate is for our biosphere. The first question that would naturally flow would be where is our current trend in relation to this finding. That nobody seems interested in this vital comparison indicates that there climate is being studied for other purposes. Since all the urgent demands that flow from today’s climate science all converge on policy solutions that involve statism, bigger government, higher taxes, less personal liberty, the bigger picture tells me all that I need to know about “climate science”. I am also curious about how deep the ice got during the last period of glaciation of the northern hemisphere, but that is a question for another time. I really appreciate you posting from time to time that reminder of the IPCCs mission. As a long-time reader and participant here at WUWT, that was something that impressed me early on that there was no reason to expect skeptical or contrary views to CO2-based CAGW from the IPCC. Newbies here at WUWT will always benefit from seeing the IPCC mission clearly presented. Thank you, sir. Dr. Tim Ball’s essay is a pretty nifty expose’ of some of the lengths that the unaccountable IPCC has gone to in order to keep the gravy train chugging along, let alone advancing the agenda behind the creation of the IPCC. The science is quite interesting here at WUWT, but I always appreciate the injection of some discussion of the political aspects of the beastie called CAGW. Thank you, Dr. Ball. In the graphic of Figure 2, the conifer is a white spruce (Picea glauca), but in the text it becomes a white pine – probably Pinus strobus. BTW, the graphic reads (Pinus Glauca), but only the genus should be capitalized. . Figure 2 is a slide linking R. B. Alley’s temperature plot with a photograph of a fossilized 4940-year-old White Pine located 100 km north of the current tree line. But, don’t use the word “conspiracy”. Includes Dr Ball’s discussions with HH Lamb. The summation is good. Climate alarm in a hazelnut shell : [A] little acidic. Re the satellite temps and the land record: I like the idea of showing the land record as a separate line, not stopping at 1979 when the satellite period begins. For one thing, it shows them running in parallel with a gap between. Nothing wrong with that. For another the two measure different things and it would not be good to have people think the satellites measure ground temperatures. What is important is their trends. If it emerges that the reported temps are projections in many places don’t be surprised by the responses of the shameless. Fudge, waffle and denial. It would not surprise me in the least if the Conus was cooler now than in the 1930’s. Yes it is hard to tell, but one thing is sure, CO2 is not having any detectable influence on the trend. Dr. Ball, re your figure 5: I am impressed whenever I see what looks like weather data of such antiquity. Does this information come from proxies or from weather logs dating back to those times? “This is where the Seven Alarmists scientific judgment was lacking – they embraced the CO2 meme with irrational exuberance and gave poor old Blair ,Cameron Clegg and Miliband the feeling that CO2 disaster was certainly coming and so embarked on their quixotic pursuit of windmills, solar panels biomass, fossil power plant closings, GHG targets and the whole quite mad dogs breakfast that constitutes British climate and energy policy. I do hope that some of the Seven might even yet review their positions along the lines outlined above and at least say publicly that any coming warming is much less certain than they once thought and that the government might usefully abandon their wasteful subsidies of renewables and forget GHG emission limits and thus reduce the price of energy to British industry and ordinary people. The scientific underpinnings of the anthropogenic global warming thing are correct. The problem is that models have been demonstrated to be quite inadequate. The science is settled but the science’s application to real world conditions is in doubt. There’s no telling if the effect is worrisome or not. Until proper models have been engineered there is no way to know what to do. The problem is not with the scientific principles, it’s with the engineering of a prediction based on the principles. It has nothing to do with climate but everything with taking away the power from the experiment ‘We The People’.It has been a hoax since the beginning created so we give up our rights voluntary to save the planet. Of course this is nothing new because those in power have done this since the beginning of humanity. Power corrupts. Once you get used to the red carpet the applause the unlimited power most get addicted to this way of life. Once upon a time a long long time ago John Adams wrote a Dissertation on how to preserve Liberty before he/we knew liberty. In other words in order to preserve Liberty, the voters must have the most intimate knowledge of the historical conduct and moral character of their chosen leaders before the fact. To sustain liberty this right is indefeasible or can not be made null and void. In today’s America this right has been superseded by political correctness, the hidden communications and secret messages transmitted between our government agencies, Congressional Representatives and the Executive Branch. Our Chief Executive is the most egregious example; and forbids the use of this inalienable right. In today’s America every effort is made by most Politian’s to obfuscate and mislead the voters in all things associated with civic knowledge. Civic knowledge has the lowest priority of all courses taught by our grammar and prep schools. Ask any 6th grader to recite the Pledge of Allegiance. They cannot because in today’s America it would be a lie. Fig,5 : Fewer than 10 percent were southerly winds in the decade 1721 -1731 but they were more than 10 percent between 1841-1851. Thanks for that. Just take a look at this graph for the CET and also the N. Atlantic records (the highest cumulative number in my data file) for the 1721-1731 decade. It would be a great +, if Dr. Ball can confirm the data. This post started with an important, traditional definition of knowledge that is, unfortunately, contrary to what the IPCC uses. It is also contrary to the intentions guiding K-12 and higher education reforms all over the globe, especially in papers issued by the National Research Council guiding the incorporation of the Next Generation Sciences Standards within the Common Core ELA standards. Briefly the relevant ‘knowledge’ is now to be provided concepts that in turn are to guide people’s perceptions of their lived experiences. CAGW is just one of those concepts but it is a crucial one because it guides the sense that transformative economic and social change is necessary. Bad weather reenforces because that is how the conceptual understanding is structured. Knowledge then is conceptual beliefs about how the world works and the physical images tied to those beliefs. It’s also why gaming and virtual reality are so crucial to the curricula NSF has been funding to implement these visions. Perceptions of reality are firmly guided by whatever the programmers designed into their work. Designers like the influential Jane McGonnigal have bragged about designing games that will convince the student players of the need for transformational change. This acute problem of trying to remake the nature of knowledge in the 2st century to augment governments ability to plan economies and societies and reward cronies has got to be stared straight in the face so we can deal with it. Otherwise we are funding our own demise with foreseeable consequences. dipchip-I have been explaining recently on my blog that civic education does not mean what we believe and is shifting us towards what is being called deliberative democracy based on required Racial Equity Outcomes. It is also being called Participatory Governance with everyone with an ‘affected interest’ supposedly entitled to a role in decision-making meant to bind everyone. http://www.invisibleserfscollar.com/experimenting-on-people-and-places-via-the-rockefeller-process-of-communication-for-social-change/ lays this out with lots of links to the documents. The reference to the Rockefeller process of KFSC comes from a World Bank document. That really is the name of this globally intended means of invisible but transformative social change. Like it or not. My book also lays out that the word Competency as the purpose of a new vision of K-12 keeps tying back to Civic Mission of the Schools reports that describe creating John Dewey’s participatory democracy of economic justice for all. I wish this is not what the intentions are but there really is no ambiguity in what is being sought in the name of civics education. The Workforce Innovation and Opportunity Act that sailed through the US Senate last week provides funds for community organizing groups to integrate English language instruction for adults with this Deweyan definition of civics ed so the to-be citizens learn English and the need for structural change at the same time. I read all 812 pages yesterday. I knew from who was plaesed with the act that it had to be bad. I was right. Robin: This was to be written for my E-mail list before you responded and now have a few additions. In today’s America this right has been superseded by political correctness. The hidden communications and secret messages transmitted between our government agencies, Congressional Representatives and the Executive Branch are the basis of all new law. Political expedience trumps all useful governmental change with examples of doom to excite the masses for votes. In today’s America every effort is made by most Politian’s to obfuscate and mislead the voters in all things associated with civic knowledge. Civic knowledge has the lowest priority of all courses taught by our grammar and prep schools. The most dire situation involves political science courses taught in our institutions of higher learning; where the free flow of certain political opinions are suppressed to the point of physical harm if they are expressed or promulgated to the student body or administration.. The scientific underpinnings of anthropogenic global warming are not correct. It comes down to a failure, originating with Carl Sagan, to understand basic radiative and IR physics. 1. The black body surface IR emission assumption confuses Irradiance, a potential energy flux, with a real flux. in reality the surface emits at 0.16 mean operational emissivity, mostly in the ‘atmospheric window’. 2. There can be no thermalisation of GHG-absorbed IR in the gas phase because that would breach Kirchhoff’s Law of Radiation. 3. There is no back radiation, see (1) and (2). 4. He got the aerosol optical physics wrong, misinterpreting work by van der Hulst: the sign of the AIE is reversed. Note the 2012 reference is titled “Global Cooling: Strategies for Climate Protection” By Hans-Josef Fell. Yes indeed. Freedom/Liberty is won on the battlefield with blood and treasure. It is lost through a misinformed electorate in the ballot booth, VOLUNTARILY. WUWT doesn’t have an “end” — it is a blog hosted on WordPress which in turn is hosted on three datacenters. It isn’t his server. The webservers will make a guess at your native language based primarily on the request header sent by your browser but also by the IP address. If the IP address is known to be from Turkey, the webserver will “localize” certain elements thereto. If you are indeed in Turkey this is normal behavior. If you are NOT in Turkey then perhaps the proxy that is intercepting your browsing is in Turkey. That is usually a Bad Thing. …This is completely in accord with the official purpose of the IPCC. The IPCC is only permitted to say AGW is a significant problem because they are tasked to accept that there is a “risk of human-induced climate change” which requires “options for adaptation and mitigation” that can be selected as political polices and the IPCC is tasked to provide those “options”…. I’ve worked in local government for almost 25 years. One thing I’ve noticed is that the more the authority has become centralized, the more politically correct and nonsensical decisions and detached from reality policy has become. The IPCC is just a tool to move authority and policy even further from reality. Thanks for your input, and for your records. Wind direction could have been recorded pretty accurately in the 18th century, but I am always curious as to whether the information comes from diaries, historical accounts, or instruments. As we stretch our reconstructions back in time we have to use all three sources, and more, with, of course, attendant uncertainties. You may want to consider that the warmest temperature spike in Greenland from 1350-1150 BC, was very cold in the mid latitudes and caused the collapse of many civilisations including the Minoans that is named after. and compare to CET, they are travelling in opposite directions. So Greenland temperatures are an inverse proxy for the temperate zone. IPCC clearly states that their mandate is to study man caused and only man caused sources of climate change. Natural forces and sources could overwhelm man caused and they don’t look and don’t care. Just like all of us, they know who signs their checks and what those signers expect. Discovering that CO2 change and therefore human activity does not cause global warming is a start. But this leaves the question of what actually does drive average global temperature change. The calculations use data since before 1900 which are publicly available. I thought Connolley messed with 5000 Wikipedia articles, not 500? First, Thank You so much for this article. It sums up very precisely the arguments that many have made. Second @ Richard Verney, trying to tease temperature data from tree rings is useless, unless you are a complete idiot and know nothing about how trees grow, yes temperature is important, but so is moisture, amount of sunlight, type of tree and soil conditions. Was it on the sun side of the hill? What was growing next to it? What kind of plant hormones did those trees produce? Are you wondering what kills those weeds in your yard? Elevation? What’s the range? Both in height and latitude? You don’t think that the rings will be different at the northern and southern limit of its range, or the level above sea level? I can’t believe that this was accepted as evidence of climate change. Supposedly, he cut down over 70 trees till he found one that matched the record he wanted. Hearing this about Sagan doesn’t surprise me one bit. He always came across to me as a politically-motivated phony. If he were alive today, he would be one of the high priests of the Church of AGW. And he would be appearing in the leftist media quite often to tell everyone how stupid they are to have the slightest doubt of AGW. He said man made greenhouse gases, showing a belching station, caused warming. This precedes an ice age. It does, but not man made, sun made. Be interpreted as meaning ..
…..leaving it open to them—-or even signaling an obligation for them — to provide just as readily, information that concludes or suggests that human-induced climate change is insignificant? It’s deliberately ambiguous IMO—maybe to cover themselves in order to claim if necessary, that they’re not at fault because the contrary information was withheld from them. The data in Figuree 5 was derived from daily journals and meterological logs maintained by the Hudson’s Bay Company. I created a coding system to digitize the weather data and ended up with approximately 6 million individual weather data points on precipitaion, wind, temperature, etc and many proxy indicators such as date of arrival of geese in spring. I was then able to plot a multitude of graphs such as the one for a sepcific study in Figure 5. All the data for two locaqtions, Churchill and York Factory on Hudson Bay are in printed olumes at Environment Canada at downsview. Your post at July 1, 2014 at 7:32 am which is here makes an interesting comment on the IPCC described in my post at June 30, 2014 at 1:15 am here. I agree with you that the phrase taken out of context allows the IPCC to reverse position. However, in its context I think the meaning is clear and its wording is not ambiguous. The IPCC has a “Role” which decrees it is tasked to fulfill a political function and not a scientific function: it does what it is intended to do. When scientists have a theory, they diligently search for data that contradicts their theory in order to improve the theory, and they welcome the views of others. They adopt the scientific method. Propagandists, however, cherry-pick only data that appears to support their theory, they discard the other data, then they place their theory on a pedestal claiming it is indisputable ‘gold standard’ settled science fully backed by a consensus. And God help any reputable scientist who dares challenge the theory with valid scientific data!!!! Well, without a doubt, the propagandists have been driving the catastrophic man-made global warming agenda. As much as I sympathize and might even share some of your resulting views, in this case I think the scientists doing the real work are doing exactly as you say where it makes sense to do so. What I mean by that is your purpose out in the field may be to collect data rather than to confirm or challenge a specific theory. In my opinion it is better this way NOT to have a specific theory in mind you are trying to confirm or deny. What kind of data could exist to disprove a guess or improve a theory of AGW? Nearly everything is an “induction” — the only actual measurement shows that temperatures go up and sometimes down. For more distant past you don’t have temperatures, you have “proxies” whose conformity to temperature varies from pretty good (Vostok ice cores) to rather lousy (tree rings). To be sure, you can find correlation but establishing that one is the cause of the other is not so easy to determine, perhaps impossible to determine. For instance: Divorce rate in Maine has a .992558 correlation with the U.S. Per Capital consumption of margarine. Some indicators are invisible to non-educated. I have a geologist friend who on looking at a photo I made of canyonlands told me the prevailing wind direction from millions of years ago. That really seemed like he was pulling it out of the nether regions but he explained to me that the huge sand dunes are pushed by the prevailing winds and leave tell-tale “slip faces” downwind or on the lee side. You can plainly see these slip faces and bedding planes (the bottom of the dune). Now, I too see ancient winds blowing sand all the way across North American piling up against the mountains of southern Utah and northern Arizona. So I give the scientists the benefit of my doubt. On the other hand I give politicians the benefit of my skepticism. When a scientist plays at politics (MM) or a politician plays at science (AG) then for me skepicism is stronger but it is not exclusionary. I will still study the science and that is one reason this particular blog is useful — more science as compared to some and you can ask questions. Tim Ball, excellent call on the way science was sold out, and as an Australian I am ashamed of the part that some Australians played, like Tom Wigley, he was in the box seat to have exposed these charlatans when he rose to head up the Climate Research Unit in the U.K. and unless I am badly mistaken he had none of the integrity of Lamb and unfortunately was right in the middle of the corruptive influences that have sullied that institution and bought into question his prior association with the Australian Bureau of Meteorology another institution that like the CRU, lost its way. Where is the conscience of those that knew, and must have understood what was going on, but allowed other fine scientists (colleagues) to have their reputations put down, their work blocked and subverted and what for? Pursuit of personal fame and fortune, and as can be seen from another prominent Australian that fame and fortune is as fickle as the integrity and character of the person. It seems inevitable in the field of climate science that truth will prevail and some reputations will be reduced to tatters, perhaps still time for some to right the many wrongs that have been done to fellow scientists. One consolation for me, is that our Fred Daly stood proud and tall opposing their tainted science until to the relief of the “team” he passed on. The late great Fred Daly will live on in history, with his integrity intact and remembered for his defence of science and colleagues. There are other fine Australian scientists who have taken up the challenge and I thank them for their strength of character. The legacy of those that crossed that dark line and failed to defend you when you stood up for the integrity of science, will have to live with that personal failure for the rest of their lives. Mea Culpa! and an abject apology to the Late Great John Daly for misnaming him as “Fred”! I really can’t forgive myself for such an error! It would be nice if we had an edit function to correct the text, but then the old adage kicks in that one should check several times “before” posting. It would be nice if the moderators could correct that stupid mistake for me! !